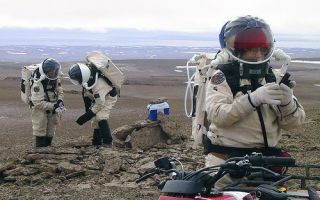 The Mars Society will attempt to conduct a one-year simulated human Mars exploration mission in the Canadian high Arctic at its Flashline Mars Arctic Research Station (FMARS). This scenario depicts crew members checking their equipment during a simulated EVA. The Mars Society plan, called Mars Arctic 365 (MA365), will attempt to conduct a one-year simulated human Mars exploration mission in the Canadian high Arctic at its Flashline Mars Arctic Research Station (FMARS). Participants may appears as depicted here.